Beachfront. Pool. 6 bedrooms, 5.5 bath, sleeps 19. Nice. You'll love Seafoam! I own Seafoam--and several other homes right on the beach. You won't find lower prices! 15-45% off all remaining weeks through fall! We are booked solid til the May (and all but 2 weeks of summer 2019!). Soo... how about we wrap it up! 15-30% off regular rates for stays 4-6 nights. That'll be close to 30-45% off with my usual get 7 for the price of 6 deal! Pricing is already factored in to rates through fall! Great deals won't last long. 6BR 6BA. Gulf Shores. West Beach. Right on the beach. Pool. Large decks. Extra fridge. More. Nice! Located directly on the beach of the Gulf, just waiting for you to come and enjoy the surf and sand! With over 3000 square feet, this is the perfect home for reunions, large get togethers, or families seeking space in an upscale setting with unparalleled beachfront access. What more could you ask!? The six bedrooms and bonus room of this beautiful home sleep up to 18 people (K, T&T, T&T, Q&Q, K, K, SS, SS). Sleeping accommodations include 1 king bed on the main floor, 1 set of twin beds on the main floor, 1 sleeper sofa in the downstairs living room, 1 set of twin beds upstairs, 2 queen beds upstairs, 1 sleeper sofa in the upstairs TV room, 1 king bed facing the beach and another king bed facing the beach. There are six baths as well. This immaculate two story home has spacious decks. In fact, each bedroom has a deck. The large great room area is close to 900 square feet with decks facing the gulf. There is a carport underneath the home provides covered parking with a storage unit and an outdoor, enclosed, shower and an open, outdoor shower.The house also features two outdoor picnic tables. Seafoam has a shaded pool underneath, perfect for children or those looking to avoid too much sun. Additional features include TWO central air systems, a master room jacuzzi tub, and professional decorating. The large, open kitchen has a garbage disposal, dishwasher, microwave, and TWO refrigerator/freezers, and custom-made cabinets. The home also offers televisions, dvd players, cable, internet, telephone with free domestic long distance, a washer/dryer, and ceramic tiled living and dining rooms and baths. The entire house is beautifully decorated and features a stain glass window in the stairwell. Instructional designer. Behavior change researcher. Father of 3. Teacher. Soccer coach. I'm interested in why people do the things they do, what we can do to change those things so that folks live happier and healthier lives, and how technology can help. Plus, well, I love Gulf Shores! My wife's family have traveled to Gulf Shores and Orange Beach Alabama for decades. I became a tag along in the late 1990s, so a Gulf Shores guy by marriage. One thing led to another and we ended up a lot of large, family-friendly, large group friendly, places along the Gulf. Right on the Gulf. Nothing between you and the water but white sand beach! Both a large dining table and a large island with bar seats. Discounts for long term stays during non-peak seasons available. Saturday to Saturday stays during peak season may be waived for last minute reservations. Rates and descriptions are not guaranteed and are subject to errors, omissions, and changes. Shrimpfest, Hangout Fest,and Spring Break weeks (which change year to year) are Peak Summer, and may not be reflected in the pricing tables. 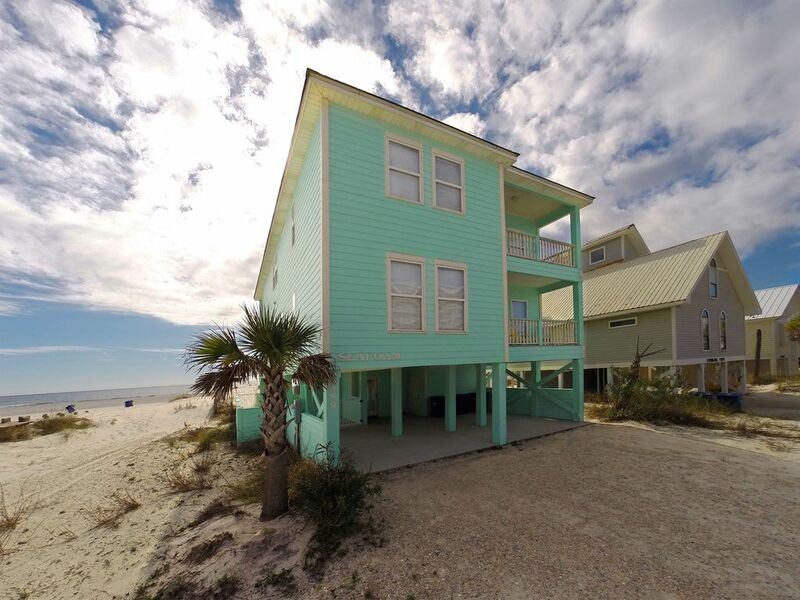 Security deposits are required under some situations and weeks, generally, but not limited to, Spring Break weeks, and are NOT included in VRBO estimates. Contact us for more information about any of this. Our family owns other properties in the Gulf Shores area, so let us know if you need something else. We will work with you. Thank you!